and Reinvest the majority of their profit/surplus in the fulfilment of their mission (Barraket et al, 2016a: 3). (Barraket et al, 2016b: 9). … it is clear that the language of social enterprise does not yet have distinct meaning for many civil society organisations and businesses in this country; more than 150 organisations commenced the survey and were filtered out on the basis that they were either not for profits that did not trade or profit maximising businesses that were not led by public or community benefit (Barraket et al, 2010: 36). SEs also take many different forms and operate under different legal structures which means they are not always visible in the same ways as businesses in the private sector. Since 2010 the FASES project has identified a number of key facts and defining qualities illuminating the SE sector. … creating meaningful employment opportunities for people from a specific group, and developing new solutions to social, cultural, economic or environmental problems. Interestingly, this is different from the 2010 report findings which identified ‘creating opportunities for people to participate in their community’ as the most popular mission (Barraket et al, 2016a: 5). The growing interest in employment is no surprise given the growing unemployment rate in Australia, which particularly affects young people. The Trading Economics website reports a decrease in the youth unemployment rate between May and April of 2017, however young people are enduring the unwanted effects and consequences of a lack of employment options and meaningful full time work. Almost one-third of Australian young people are unemployed or underemployed, the highest level in 40 years, according to a report released on Monday. The rate of underemployment – now at 18% – has become an entrenched feature of the youth labour market, according to the Generation Stalled report, commissioned by the Brotherhood of St Laurence (Davidson, 2017 March). A lack of full-time job prospects and an increasingly tense world has left a generation of Australia’s young people feeling bleak about their future (Clarke, 2017 February). SEs reflect social and economic concerns as they operate mostly in local and regional markets with the aim of fulfilling missions that resonate at local and regional levels. There are fewer SEs that operate in international markets or aim to address international issues (Barraket et al, 2016a: 4). This finding was reflected in our own modest search of Arts based social enterprises in Australia. We found that when SEs do focus their attention on international issues, they often adopt a ‘Fair Trade’ ethic and source or support the import of handcrafted goods to be sold in Australia. Rarely were there programs (i.e. Transitional Labour Market Programs) attached to these SEs. Similarly to 2010, and mirroring the mainstream economy, the sector includes small, medium and large enterprises, with the majority in our sample being small. The 2016 study again finds social enterprises are involved in all forms of economic production, including retail, wholesale, and manufacturing. However, they operate primarily within the service economy, with 68% of the sample providing services for a fee (Barraket et al, 2016a: 4). In 2010 organisations participating in the FASES research project were asked to report on their income and expenditure (for the 2007-2008 financial year). The reported annual turnover ranged from zero to $68 million (with a total reported turnover within the sample of 168 organisations of $477 193 850). In 2016 that annual turnover ranged from zero to $199 million (from a sample of 189 enterprises) (Barraket et ala, 2016: 22). and, limited public awareness of social enterprises and their work. the lack of suitable funding for SEs at different stages of development (Barraket et al, 2016a: 5). organisations grew and changed was also identified as a problem (Barraket et al, 2016a: 4). These barriers have consequences for the Impact social enterprises make, that is the effectiveness of their work and how they are able to carry out their mission. When asked about how the SE sector in Australia could be supported and the role of the government, more than 80% of respondents thought that government policy support would create new opportunities and generate growth. Activating SE though ‘traditional procurement laws of government’ was suggested (Barraket et al, 2016b: 15). Better support during the start up phase was called for which would include: greater availability of intermediaries; more opportunities for peer-to-peer learning; cohesive and continuing support from the Australian Government; greater public awareness of social enterprises and their work (Barraket et al, 2016b: 16). Many respondents called for better, more suitable financial support at different stages of development. Because of their location some SEs are not able to access funding, particularly those outside metropolitan areas. The right financial support at the right time can make a big difference (Barraket et al, 2016b: 17). … philanthropy appears to be playing a proportionately more significant – albeit still relatively small – role in financially supporting social enterprises, particularly those in start-up development since 2010. 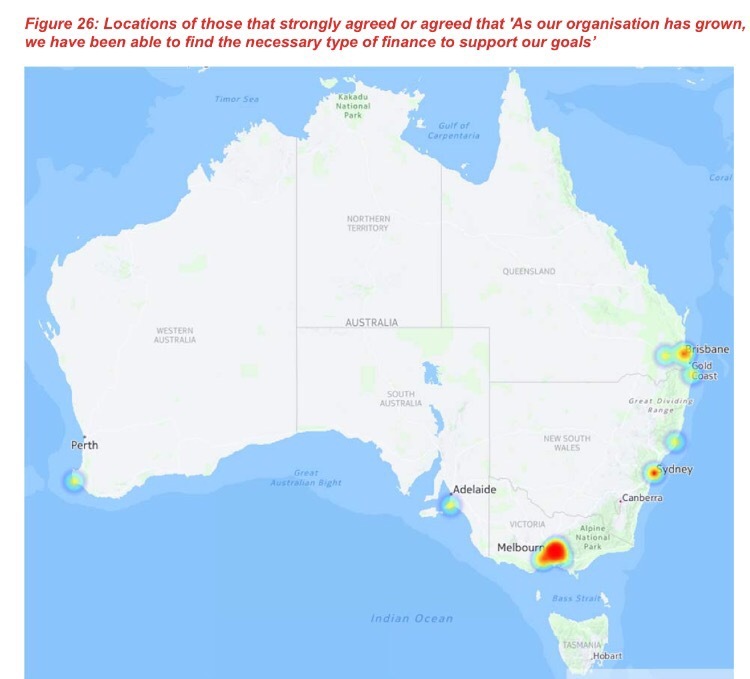 This may suggest a growing awareness of social enterprise by philanthropy, and the extension of some partnerships between philanthropy and not for profit organisations that are now exploring social enterprise as an option for increasing their impacts or improving their financial viability (Barraket et al, 2016a: 32). While impact measurement is largely regarded as a contested and complex issues for SEs, Barraket et al (2016: 18) suggest that more accessible, comparable and affordable impact measurement tools are needed to help articulate the social impact of SEs (Barraket et al, 2016b: 18). Additional survey research suggests the costs of undertaking impact measurement are prohibitive for many social enterprises (Barraket et al, 2016a: 31). Continuing lack of convention around measuring social impacts, and lack of availability of affordable options to do this work, was a frequently cited constraint on social enterprises both understanding and extending their positive impacts; practice in this regard appears to have remained stable over the last two waves of FASES. 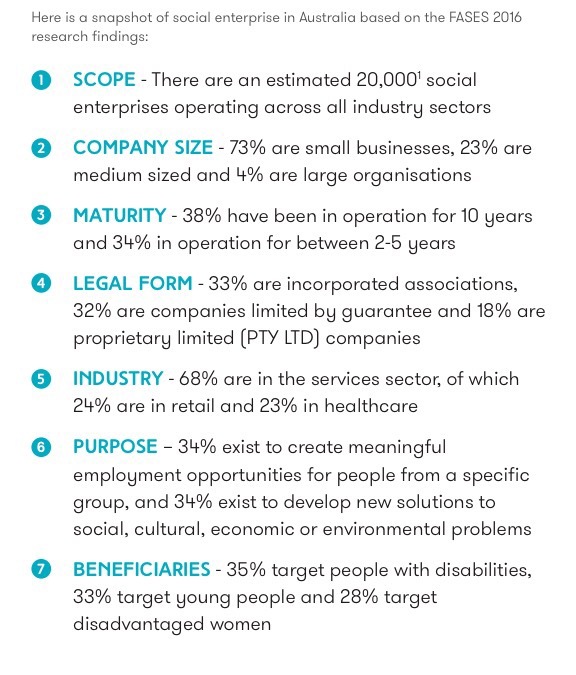 Major opportunities identified for increasing social (or environmental) impacts of social enterprises included ethical supply chain development – including between social enterprises – and replication or, less frequently cited, scaling up of social enterprises (Barraket et al, 2016a: 32).